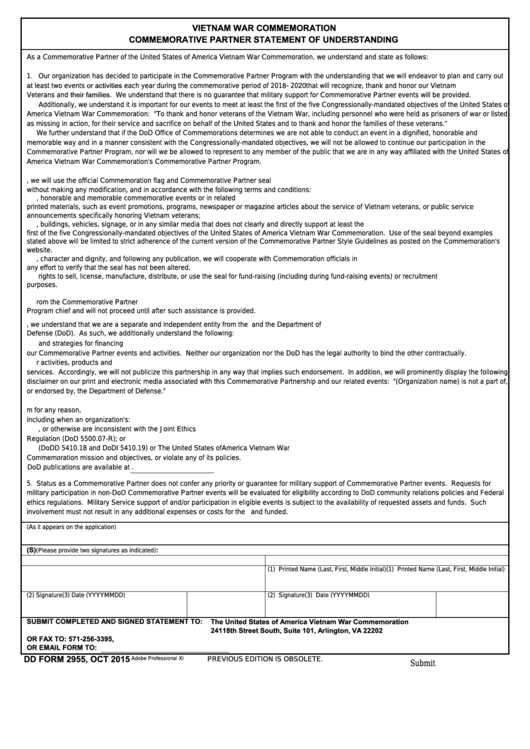 Download a blank fillable Dd Form 2955 - Vietnam War Commemoration Commemorative Partner Statement Of Understanding in PDF format just by clicking the "DOWNLOAD PDF" button. Complete Dd Form 2955 - Vietnam War Commemoration Commemorative Partner Statement Of Understanding with your personal data - all interactive fields are highlighted in places where you should type, access drop-down lists or select multiple-choice options. Veterans and their families. We understand that there is no guarantee that military support for Commemorative Partner events will be provided. as missing in action, for their service and sacrifice on behalf of the United States and to thank and honor the families of these veterans." America Vietnam War Commemoration's Commemorative Partner Program. any effort to verify that the seal has not been altered. e. We will have no right to reproduce the flag or seal for purposes other than those enumerated above. Program chief and will not proceed until after such assistance is provided. our Commemorative Partner events and activities. Neither our organization nor the DoD has the legal authority to bind the other contractually. or endorsed by, the Department of Defense." Commemoration mission and objectives, or violate any of its policies. involvement must not result in any additional expenses or costs for the U.S. Government which have not been previously budgeted and funded.